A Year of Being Here: Kirsten Dierking: "Sailing on Lake Superior"
below us the nearly endless cold. the miles of empty and sparkling blue. across the deck of our delicate boat. weren't just lovely, but everything? 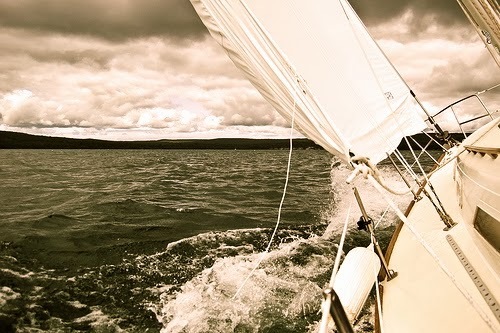 "Sailing on Lake Superior" by Kirsten Dierking, from Northern Oracle. © Spout Press, 2007. Photography credit: Tom Stuart (originally color).